The CCISO program is for executives looking to hone their skills & learn to better align their information security programs to the goals of organization as well as aspiring CISOs. Other information security management certification programs focus on middle management. CCISO focuses on exposing middle managers to executive-level content as well as encouraging existing CISOs to continually improve their own processes & programs. How does C|CISO Training Help? C|CISO is the industry-leading executive information security training program created by CISOs for aspiring and current CISOs. The C|CISO does not focus solely on technical knowledge but on the application of information security management principles from an executive management point of view. This program hones the skills of existing executives as well as helps middle managers (someone who might hold a CISSP for example) make the leap to executive management. Domain 1 covers the importance of Governance, including solid policy writing, aligning the security program to industry-recognized frameworks, and adhering to sometimes contradicting law and regulations. Domain 2 focuses on Management Controls, Audit Management, and Risk Management, leading students through detailed examples of how to run an audit as well as implement audit findings, choosing the correct management controls for each situation, and the importance of understanding asset value, risk tolerance, and risk treatment plans. Domain 3 focuses on what makes up the bulk of a CISO’s day – Project Management and the importance of ensuring information security is part of projects from their inception. Domain 4 is the only CCISO Domain that focuses on technical topics as a high level of technical proficiency is assumed of all CCISO students. Domain 4 stresses the importance of understanding technology and information security core concepts in order to lead teams of technicians and analysts and make decisions around technology issues. Technical issues are addressed from an executive point of view. 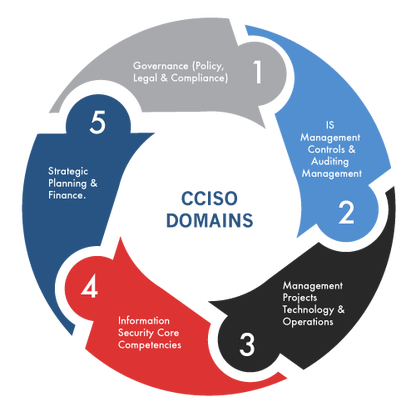 Domain 5 consists of content regarding leadership, aligning security programs to the overall goals of the business, strategic management, executive buy-in, financial management and much more. Domain 5’s content sets the CCISO program apart from all other infosec management certifications on the market by teaching the content that technical CISOs are usually lacking.